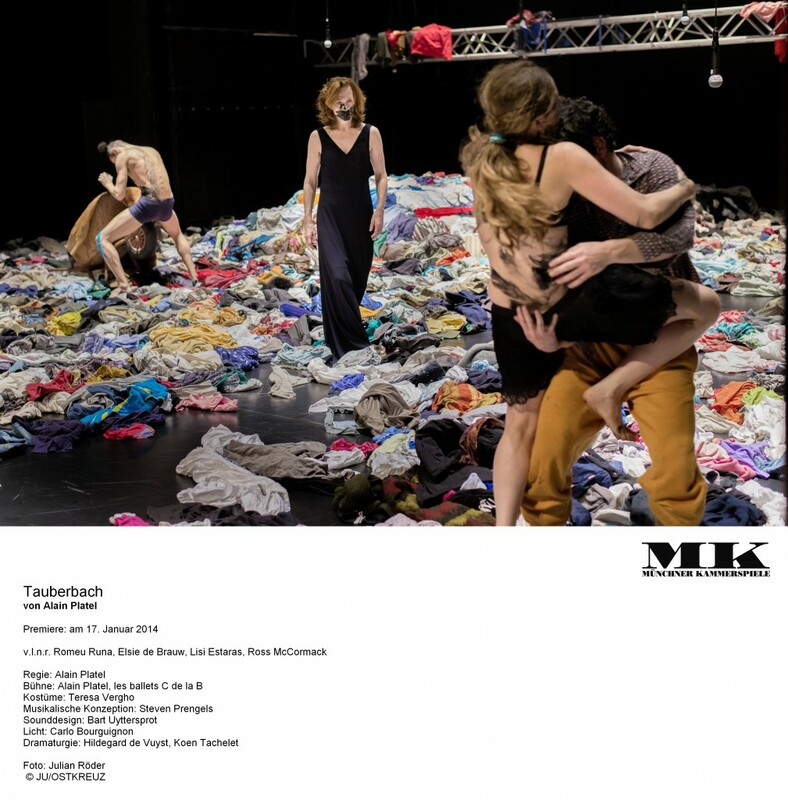 We meet up with Alain Platel, choreographer, director and stage designer of Tauberbach for which he was invited to this years Theatertreffen 2014. The main character “Estamira”, played by actress Elsie Brouw, wanders a place on the margins of society, covered with all kinds of clothes and dancers, like splittings of her mind, raging the stage, appearing and disappearing. A conversation about mood, material and transforming into worms. 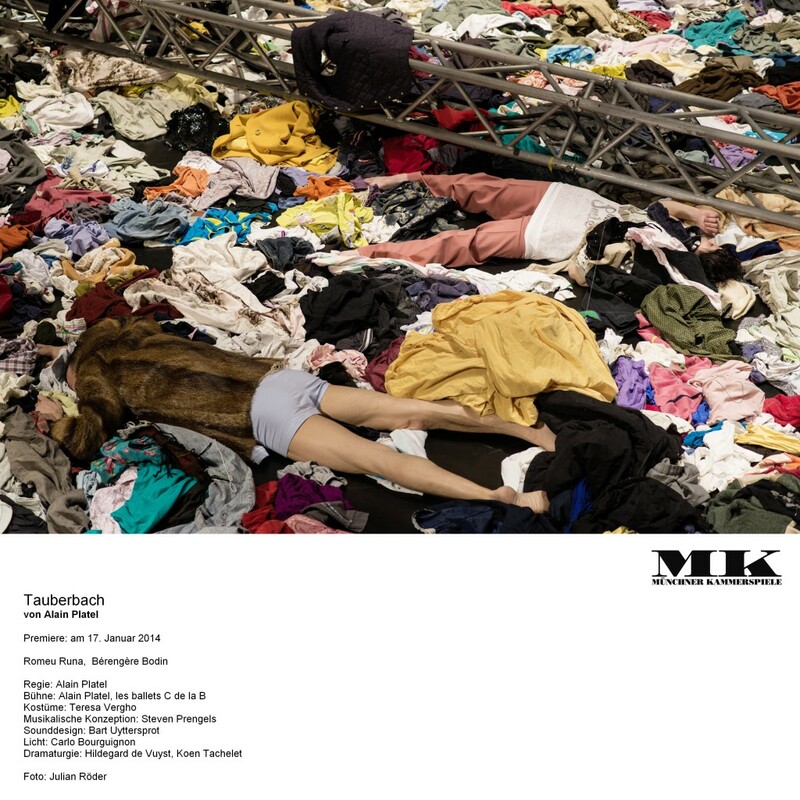 ROB KRAATZ: Your piece Tauberbach is based on the brazilian documentary „Estamira“1. The play is your concept and you directed it as well doing the stage design. How was the process of creating this setting and how much influence did the group [Les Ballets C de la B] have? ALAIN PLATEL: It’s very irregular that I work with stage designers, sometimes I do and sometimes I do it myself. There is no logic in it. With Tauberbach I first had the idea to cover the stage with plastic bottles ‚cause I thought it could be interesting to dance in plastic bottles, but it’s so tiring and gets on your nerves that we tried to find an alternative. It was one of the dancers who came up with the idea of the clothes, because we had another performance made in 2006 where we had a huge mountain of white underwear, and he was saying: what if we put down all these elements and see what it does. So if you ask what is their impact or influence – I listen to what they say! We were sure we wanted to cover the whole stage with something – which is not very original – and to have some reference to the world of Estamira without being to literal. We could have taken junk for a junkyard but thought the clothes were an interesting alternative and the interesting thing is, that it makes everything happening on stage very silent, in terms of movement. It was also funny to see that when they lay down they disappear completely. So you could appear in disappearance. THEA HOF: I felt like these bodies were like worms, going through the material, human bodies trying on clothes, getting rid of them, becoming animals again, through the clothes, through the stage, shifting bodies from ground to human to clothes. We talked about transformation in the discussion before, was this transformation, becoming human – becoming body, part of the content? Alain: Yes, it was something we discovered by working with it, it had such a huge potential, it was nearly endless, we kind of had to limit it at a certain point ‚cause it can also become a trick, like what can you do with the clothes, and some of the material we found we had to cut ‚cause it was too much tricky and we had to find a good balance between what could be used and what not. And it’s interesting: the trusses that we use are in fact trusses from the studio we’re working in. They’re very fascinating and I always dreamed: can you hang on it? And by these fantasies about it, we decided to put it into the concept of the set. So these things are happening during the rehearsal period. Thea: I’m always interested how you can invite to a certain mood through stage design. You said before, the clothes are making everything very quiet, that’s one big thing people can relate to. So do you work with the stage in mood-orientated way and how? Alain: I remember I first had these thoughts when I was confronted with the pieces of Pina [Bausch] because especially in the beginnings she uses the surface. It was very important, either grass or sand or water2 and I remember one of the performances she made was Arien  and she made the whole performance and only in it’s very last moment, I think two weeks before the premiere, they decided to put the whole stage underwater, but then to ask the dancers to make the same performance underwater had a huge impact on it. So it’s something that I carried with me since I saw that. 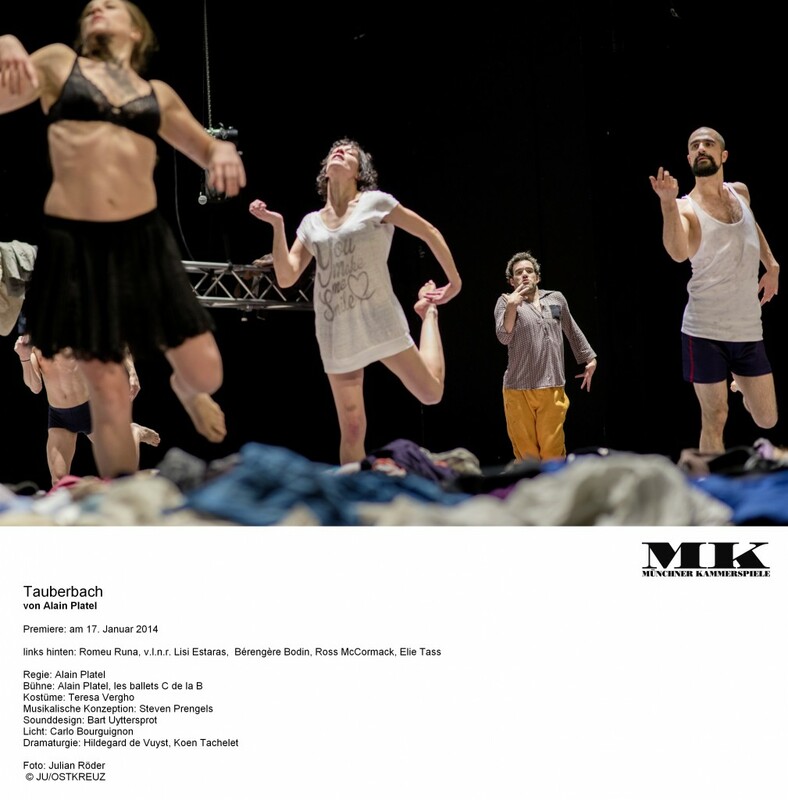 But in Tauberbach it was certain, once we started to connect the material, that the set should connect to all these moods that we discovered by working on it and it should emphasize or at least support what happens. So in that sense the set, the light and sound become the extra characters. I think it was one of the dancers that asked at the very end, before the premiere: can we just do the whole thing without the clothes? Alain: I didn’t, I was convinced it will not work, or I was too afraid. Thea: You said you work for the mood, you want to give something that emphasises on what you want to do and that’s interesting, because it’s something that I discovered more often in dance productions. It seems to be about being supportive, like giving more room and more possibilities to the dancers in an open and inviting way than in “classic” or “Sprechtheatre” where we usually tend to limit possiblities or space. What’s the reason for that? Alain: I never thought about it. It’s always very difficult. You have to be clever, nowadays, when you make theatre. Rob: But you mentioned it before when you said you actually did limit up to a certain point, you gave a lot of possibilities on stage, with the clothes, with the open space but you mentioned you had to say: ok, no more paying with the clothes now. I have the same impression like Thea that in dance theatre the stage design is more about giving a lot of space for the dancers, the movement and a certain atmosphere. Alain: Yes, and also it’s true that dancers in general are quite afraid of another surface ‚cause it can appear dangerous to them. But when said you have to be clever: there are so many fantastic set designs nowadays, sometimes you go like: whoa! And that’s what I mean, with set designers probably have this feeling that they have to be very clever, to make something very original. With this set, we were always afraid people would refer all the time to the art of Christian Boltanksi ‚cause he does a lot of artwork with clothes. Thea: But his art I think is more about death or the absence of the body. Alain: Yes, history and memory. Rob: Perfect bridge for the next one: the original Estamira lived on a landfill at the outskirts of Rio. Such places are, what french ethnologist Marc Augé would probably describe as non-places or non-lieux3, rather non-symbolic places without a distinctive history or identity, places of work, transit and pure functionality. As Marc Augé reflects, these place grow along the postmodern and neoliberal reorganisation of public space and within that grows the solitude of people. Yet your Estamira doesn’t seem to be neither lonely nor is the place she lives clearly without an identity. It sort of get’s its identity trough the dancers, the movement, That’s perhaps the utopian, the political part of it: she is an acting person who seems to fight her victimisation. But how would you describe this place? Alain: If you see the environment in which Estamira [of the documentary] lives, then I wouldn’t say it has no identity, on the contrary, it’s something extremely strong, but of course it’s a place we hide, we don’t get to see, but thanks to somebody who does a documentary on that it becomes visible. I realised this was a very strong space when I decided I want the curtain to be down and I want the first image to be: oh, all the lights are out. Light goes on and when you see the reaction of the audience, in general, people are overwhelmed and right into it, but it takes a while before they can describe what exactly they feel or what they associate. You see all the clothes but it’s not necessarily the garbage or a dump they see. For me it represents much more a chaos of life than a dump. Rob: But is it still chaos in the end, when the lights go out? Is it an open end? Or does it become – through the play, through the performance – some kind of anti-chaos, a bit of organisation? I mean, there’s a social group forming within that chaos. Alain: It feels to me like in the beginning Elsie [the actress playing Estamira] is verbally trying to make order in her mind, but also in the space that is impossible to get order into. She is surrounded by people who represent all the sensuality, physicality and emotional chaos and what they’re trying to do, is to get her, to seduce her into that world and by doing so, I have the impression, you also accept this whole world, as a set, a chaos of clothes rather than something that is “normal”. Rob: It’s the same with the bodies, I mean it’s a special issue for you, they always seem to refer to your background working as an orthopedagogue. When I see Tauberbach, I don’t really think of so called disabled people – right away I see expression, an understandable physical appearance. You’re not thinking: oh, these are odd people, do they have problems? Not at all. Alain: I think dance has always had the function of trying to physicalize emotions, the things that we can not talk about. What we try to do is to write physical language with the purpose to express these things that you cannot express by words. So in that sense you can see: these are very normal people, they’re not mentally disturbed or handicapped. The dancers were inspired by seeing images and visiting a hospital with children with very severe mental handicaps. I thought it would be a good experience and for them it was a life-changing experience! But they don’t try to imitate these people, they’re just inspired and they look for these kind of movements or images that really represent their personal feelings about things. Rob: I’m going a bit off-topic now: On the website of your group [lesballetscedela.be] you can find a statement about your group carrying out a so called cultural boycott on Israel. As it says, you’re not performing there in order to put pressure on the government. You have good connections to groups in the West Bank, in Ramallah, you’re working there from time to time and I thought, isn’t there a conflict by boycotting the stages of Israel blaming all the artists and cultural people there for their government’s policy? When you go to Ramallah, why not doing the same there, putting pressure on the local government, the PA – ‚cause it needs to be done. I can understand the basic work in support of the local Palestinian artists, it’s of course a different situation than the Israeli artists have – but I think it’s very important to go on Israeli stages and protest there ‚cause you actually can do that. Alain: We did perform in the nineties once in Israel and thought it could be done, but it’s an illusion. It’s a very tricky question, you could talk about it for long time. You have to understand one thing, there’s something which is very clear: when you’re there, there is no equality, there is really a group of people who oppress another group, it’s a daily reality. This is something you have to deal with. To put Palestinians under pressure to fight their government is a very good thing to say, and they do also. For us as a company it became very important at a certain point to take a strong stand. The only way to oppose this kind of situation in a peaceful way, is to support the boycott. And it puts people who live in Israel really under pressure, they’re not happy about that. But that doesn’t mean that you cannot work together with Israeli people. For example here in Belgium we work together with several Jewish dancers who come from Israel and for me it’s very important to work with them here in Europe, in Belgium and to confront them with Palestinian artists and vice versa. Working together with both sides, here in Europe, is very important – but on the spot itself, it’s very important to make a clear statement. I cannot accept the situation the Israeli government is treating the Palestinians and everybody living in Israel has the power to go against it by voting, and if they’re not doing it, they should feel the pressure. Rob: But they’re not a homogenous society, there’s a normal democracy. To be a bit crude: the German governments austerity measures who make the southern countries within Europe suffering a big deal, I mean they actually have blood on their hands, so why not boycotting Germany?! Alain: Yes, it’s a tricky situation. But I’m at ease with my decision. To perform in Israel, it’s true you can do that and some Belgian companies do, with this kind of vision – but I’m not convinced. I mean we’re not the biggest company in the world but it annoys people in Israel that we have this position and there is others organisations who make the connection. They work together with Israeli artists and Palestinians in the country – but I wouldn’t be able to do that. Still I think it’s good if people do so. Rob: So it’s not a campaign, its just for your own company? Alain: We publish it, but we’re not trying to convince people to follow us. It’s something we had to make up for ourselves. struggle with the situation she has to live in as well as her mental condition.